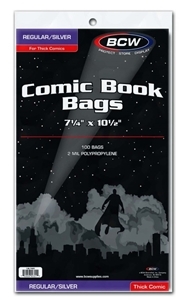 The BCW Silver Comic Bags are an acid free, archival quality product made of crystal clear polypropylene. Use this item to protect and store your collectible silver comics. Available in 2 sizes so you can now fit your thickest silver comics into the appropriate bag.